Walk-On Trip Tuesday 31 July 12!!! 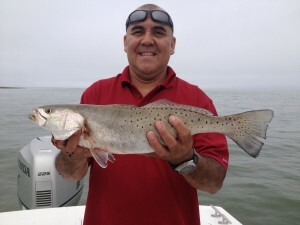 Speck fishing is great!!!! 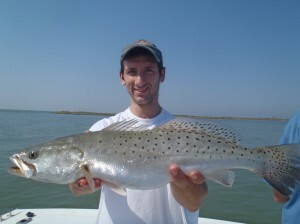 Speck Fishing is HOT! Come on out and give it a shot!!!! 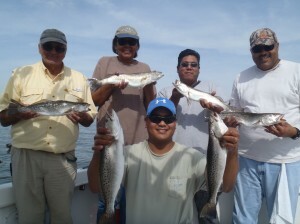 Had a great speck trip today with around 30 Specks caught. We should have not left the Speck ball park to search for breaking blues because the blues didn’t show themselves but the Specks sure did. 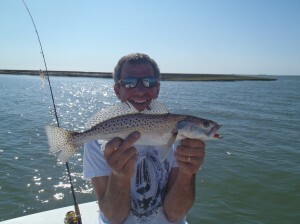 Have an open day Tuesday and with great Speck fishing and a golden weather forecast a walk-on trip is in store. We’ll launch from Solomons, Beacon Marina at 530am and return around 3pm. Cost is 120 each, I provide all baits and tackle and will fillet fish at the end of the day. If you’ve got a rod/reel you like bring it! The boat is licensed, all you need to bring is whatever you want to eat and drink. 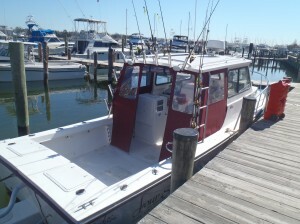 My boat is a Judge 27′ Chesapeake that will give us a great ride back and forth across the beautiful Chesapeake Bay. We’ll probably cover 8o miles or more on the trip! Beautuful fish in some pretty water! There are a few like this around! If you are interested in going on the 31 July Walk-On Trip give me a call at 703-395-9955. Come join me for a great day of fish'in on my Judge 27 Chesapeake!